A Norwegian politician has travelled to Eritrea for talks with the government about the planned repatriation of about 500 "exit mandatory" migrants. In a move that could discourage refugees from choosing Norway as a final asylum destination, the country's deputy justice minister, Himanshu Gulati, spent two days in the Eritrean capital, Asmara, last week. "We met with officials from various ministries to discuss sending some Eritreans home," he said. "These individuals are vetted by the immigration department and have been found not to have a need for asylum." Eritreans comprised 27% of Norway's asylum applicants last year. The overall number from the country applying for asylum in the EU soared by 148% in 2013, according to the statistics watchdog Eurostat. Israel, formerly a popular destination for Eritrean refugees, has cracked down on immigration in recent months, driving more Eritreans to seek asylum on European shores. Daniel Mekonnen, an Eritrean doctor who lives in Oslo, Norway, says refugees are attracted to the country because of the speed at which it approves a high volume of asylum applications. Norway may now be trying to counter that reputation by initiating deportation talks with Eritrea. "News like this spreads like fire through Eritrean communities," Mekonnen said, noting that migrants are in constant contact with refugee communities across Europe, who inform them of changes in legislation and social attitudes in host countries. An unprecedented number of migrants are risking their lives to reach Europe, with 59,880 migrants arriving in Italy so far this year, nearly equalling the total number of arrivals in 2011, according to the Italian interior ministry. A shipwreck in Lampedusa, off the coast of Italy, in October left more than 300 Eritrean migrants dead, turning the world's attention to the country's escalating refugee crisis. Many Eritreans flee in search of employment and to avoid national service, but the route to Europe can lead to migrants falling into the hands of human trafficking networks that target them and subject some to kidnap, torture, and enslavement. Eritrea continues to come under fire for its poor human rights record and its national service programme, which forces over-18s to spend most of their lives in military service or working for the government. On Friday the UN Human Rights Council announced a one yearcommission of inquiry on Eritrea, citing "widespread and systematic violations of human rights and fundamental freedoms" including torture. Eritrea rejected the resolution. Amnesty International said: "Thousands of people are currently held incommunicado in arbitrary detention for questioning government policies, for their work as journalists, for practising a religion not recognised by the state, or for evading national service conscription." Rights groups say because many Eritreans leave the country illegally, or without government consent, they can face imprisonment and harassment upon their return. "Anyone of draft age leaving the country without permission is branded a deserter, risking five years in prison – often in inhumane conditions,"according to Human Rights Watch. "In 2012, 90% of all Eritreans claiming protection in other countries were recognised as refugees or given other forms of protection." The UN human rights council moved on Friday to establish a commission of inquiry into rights abuses in Eritrea. Felix Horne, Human Rights Watch's Eritrea researcher, said: "Torture is widespread in Eritrea and any dissenters are dealt with in the harshest of manners. Eritrea does not grant access to embassies or human rights organisations to the various prisons and detention facilities located throughout the country to monitor conditions. Given these concerns it is unlikely that Norway will be able to adequately monitor the conditions of returnees to ensure that they are not being mistreated by a government more intent on silencing dissenters than living up to its international obligations." "The government of Eritrea looks unfavourably on those that flee the country, and family members of those that leave are often targeted. It is difficult to ascertain what fate awaits those who return, but given the extent of abuses against those are perceived to be against the regime there would be concern about how they would be treated upon their return," he said. Meron Estefanos, an Eritrean activist based in Sweden, dismissed Gulati's trip to Africa as a scare tactic. "I don't think Norway will deport Eritreans who don't want to leave," she said. "These rumours scare refugees away from the country." Norway receives about 12,000 applications for asylum every year. Of these, an estimated 65% are successful, Gulati says. 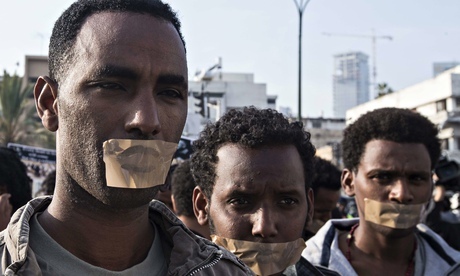 Eritreans submitted 14,665 asylum applications to EU countries last year, Eurostat data shows. Look-alike wrist watches can be purchased in a swiss rolex replica associated with the price of their own counter-top brand, however most of the wrist watches appear nearly similar towards the hublot replica. This particular functions excellent if you prefer a truly good view, however aren't monetarily in a position to purchase a real Rolex or even additional globe luxurious manufacturers. The greater costly roelx replica sale offers 3 wrappings associated with precious metal which in no way dons away. The truth is which, in the event that precious metal is continually already familiar with chemical substances or even acidity, it'll progressively fake rolex for sale. The actual acidic character from the human being pores and skin risk turning the actual precious metal just a little darkish however the tips about upkeep ought to be adopted really carefully to be able to boost the existence from the hublot replica.